The beating of a 33-year-old man and the rough treatment of teenager prompted the chief of a suburban Arizona police department to enlist a former prosecutor Friday to investigate the videotaped encounters and report directly to him. Mesa Police Chief Ramon Batista said the body camera footage of the two incidents last month left him "angry and deeply disappointed." "We will work every day to make sure these situations don't happen again," Batista said at a news conference. "I will be relentless in my pursuit of organizational excellence ... I promise you I will fix this." Batista said he had hired former Maricopa County attorney Richard M. Romley to undertake a separate investigation to ensure transparency and accountability in the process. Romley told reporters his review will take several months and is not intended to determine if any officers should be charged. "I will report directly to the chief, working to ensure there is thoroughness and objectivity in this review," Romley said. Internal investigations are also underway in both cases, and the police department in nearby Scottsdale will investigate and make recommendations to prosecutors about possible charges. Batista said he has also asked the Washington-based Police Executive Research Forum to conduct an independent review of cases involving force by Mesa police over the past three years. 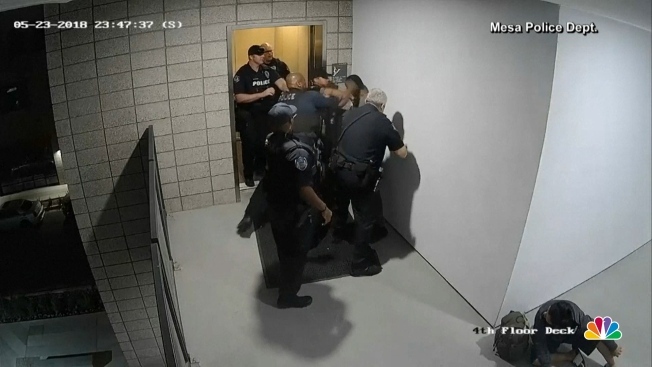 The most recent video footage to come to light from body and security cameras shows Mesa officers roughly treating a teenager who was arrested May 17 on suspicion of armed robbery and aggravated assault with a deadly weapon. The footage shows officers cursing the youth and grabbing the collar of his T-shirt tightly around his neck. In the other case, video shows Mesa officers punching 33-year-old Robert Johnson as he stands against a wall on May 23. Seven Mesa officers have been placed on administrative leave with pay — two in the teen's arrest and five in the case involving Johnson. A police report says Johnson was "verbally defiant and confrontational," but his attorneys have challenged that and said there was no reason to attack him. Johnson was charged with disorderly conduct and hindering prosecution. His attorney Joel Robbins said Johnson suffered a concussion, scrapes and bruises. Police said the encounter with Johnson occurred when officers responded to a call from a woman who said her ex-boyfriend was trying to break into her apartment. Arriving officers found the ex-boyfriend with Johnson, who said he was helping a neighbor get something from the apartment. Representatives of Lodge 9 of the Fraternal Order of Police, the union representing Mesa members, said they worried the officers involved in the two cases might not get a fair hearing in the rush to investigate. "I understand. There is a lot of political pressure," local president Will Biascoechea said. After 20 years with the department, "I don't see a systemic problem at all," he added. With about 750 sworn police officers currently serving the city of nearly a half-million people, the Mesa department has been criticized previously for its use of force. A former Mesa officer who was fired for violating department policy was tried and acquitted of a murder charge in the 2016 fatal shooting of a Texas man who was unarmed and on the ground. In February, the family of an 84-year-old woman complained that she was left with severe bruises after an encounter with Mesa police who went to her home investigating a suicidal man with a gun. Police at the time said the woman was injured when they were trying to keep her safe from the armed man and an internal inquiry was launched. Mesa Police Sgt. Diana T. Williams said Friday that case is now in the final stages of the investigation.